Working at a law firm and considering a career in environmental law. I was attracted to the ecology-based design education and the accelerated course of study. I didn’t want to spend three years in a studio doing theoretical design work; I was ready to get in, get out, and get on with the work. I wanted to learn how to get started in the work of healing land and community. Through an internet search, keywords “MA landscape design” – Conway isn’t well-known in the southeast so I was lucky to stumble upon it. The thing is, we need this kind of progressive planning and good work desperately in the south. So as much as I was charmed by New England, I went back to Georgia within a year of finishing Conway to get to work. Conway provides a rapid download of what humans have been doing wrong by way of land planning and design, and ways to start trying to do it better. It forces you to push your comfort level and push the envelope. It teaches someone with good ideas how to articulate and sell those ideas to clients who didn’t know they needed them in the first place. Conway is a design school that trains advocates for the living world. Just go for it, don’t be afraid to make mistakes; as long as you’re trying to do it more mindfully than it was done before, you’re on the right track and it’s worth trying. Conway puts a lot of pressure on you during the program to be cutting edge, but I’ve found that some of the ethics and design principles I came to take for granted at Conway are actually cutting edge and novel in the “real world” of planning and design. I’m a tree conservation advocate for a medium-sized nonprofit. I help citizens learn to speak for the trees and protect the largest urban forest in the country in a rapidly growing and developing southern city. I also volunteer with a free mobile medicine clinic that serves up herbal remedies and other earth-based care to underserved communities, including our friends on the street. The work is powerful and humane, immediate and direct in its results–healthcare activism at its best. I love connecting people the healing powers of plants, and making holistic healthcare and education accessible and affordable to people who need it most. Where we want to live, by Ryan Gravel; Edible Forest Gardens (of course! ); The Organic Medicinal Herb Farm, by Carpenter and Carpenter (because we need to start growing our medicines and building local healthcare systems, and supporting farmers to do so! ), Project Drawdown edited by Paul Hawken. The Ecology of Commerce by Paul Hawken (in the 90s) was one of the first books to grab my attention, back in college. I haven’t read it in years but I’m guessing the message is still relevant. I just started reading Let My People Go Surfing and it’s having an impact already. I also LOVE Braiding Sweetgrass. A good quality soil knife is a pleasure and a privilege to work with. Clear communication is a close second. Somehow, with a rapidly growing population, we must figure out to live with a lighter footprint than business as usual. Intelligent design and planning will be critical toward that end. I don’t know if/when I would have gravitated to herbal medicine work if it hadn’t been kickstarted by my Conway spring project, which was for United Plant Savers on their botanical sanctuary for at-risk medicinal plants. Conway also honed my public speaking and presentation skills, which I use weekly for my job. Exposure to the intersection of environmental issues and the humanities made a huge impression on me, and I use this approach in my own teachings for a local permaculture design course. I don’t listen to many podcasts, but I do love what I’ve heard from On Being with Krista Tippett. Anything out there with the writer/historian/thinker Rebecca Solnit has my attention. Below is a short piece (“The Job of My Dreams”) written by Christina for the 2014 issue of con’text magazine. The Atlanta BeltLine is perhaps the most profound urban planning and development facelift in the history of Atlanta, Georgia. It ties together a network of public parks, multi-use trails, public art, and transit by repurposing a 22-mile-long historic railroad corridor that encircles “in-town” Atlanta. Finished, the corridor will connect 45 hitherto disjointed neighborhoods. It will make alternative transportation accessible in a sprawling city of over six million people that relies heavily on automobiles. The BeltLine represents Atlanta’s acknowledgment that the largest metropolitan area in the southeast needs to act quickly to remain a relevant and viable metropolis in the post-peak-oil era. The scale of the project has required a massive public-private partnership of government agencies, non-profits, and private firms. One of them is Trees Atlanta, a non-profit citizens’ group that protects Atlanta’s urban forest through planting, conservation, and education. 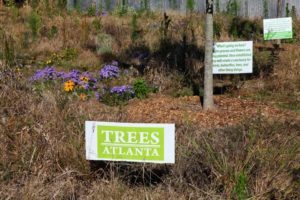 Trees Atlanta is creating the Atlanta BeltLine Arboretum, which includes trees, shrubs, meadows, and prairies. Trees Atlanta installed over 600 trees along the first, 2.25-mile-long constructed segment of the trail in fall 2012. 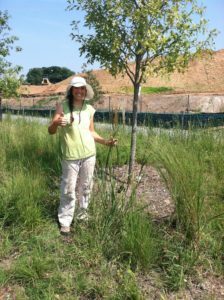 I was hired in late winter of 2013 as the first BeltLine installation intern to assist with the planting of ten acres of native grasses and wildflowers along the trail beneath those trees. My internship ended with a job offer to remain as prairie restoration coordinator. This past growing season, hundreds of volunteers planted over 109,000 plugs of prairie grasses and forbs. We are now ensuring that our newly planted urban Piedmont prairie settles into a landscape that was a linear brownfield with miles of edge habitat, new construction, ferocious weed pressure, and unpredictable southern drought-and-deluge cycles. A tall order. A humbling challenge. And an exponential learning curve that I am enjoying tremendously. The then distant prospect of working on the BeltLine inspired me to enroll at the Conway School in 2011; the sudden reality of a job offer on the BeltLine in early 2013 enabled me to work in my hometown on the project of my dreams, the project of my city’s dreams. I have found that doing land-based work on one’s stomping grounds means that taking good care of the land and the community that raised you is a no-brainer; “doing the right thing” comes naturally. Work feels less like a job and more like a responsibility. After all, they’re depending on us: migratory nesting birds; native pollinators; compacted and dead urban soils; ancient and stressed stormwater infrastructure; air quality; in-town neighborhoods and commuters. They’re all counting on us to get it right this time.